Recent scholarship on the complicated friendship between Katherine Mansfield and her bestselling author cousin, Elizabeth von Arnim, has done much to shed light on the complex literary and personal connections between these unlikely friends. In spite of their difference in age and outlook on life, von Arnim and Mansfield shared more than just antipodean family connections. Mansfield’s narrator in her early collection of short stories, In a German Pension, bears marked resemblances with the protagonist of Elizabeth and Her German Garden, and von Arnim’s most radical novel, Vera, was written at the height of her intimate friendship with Mansfield. John Middleton Murry dedicated his posthumous collection of Mansfield’s poems to ‘Elizabeth of the German Garden’. 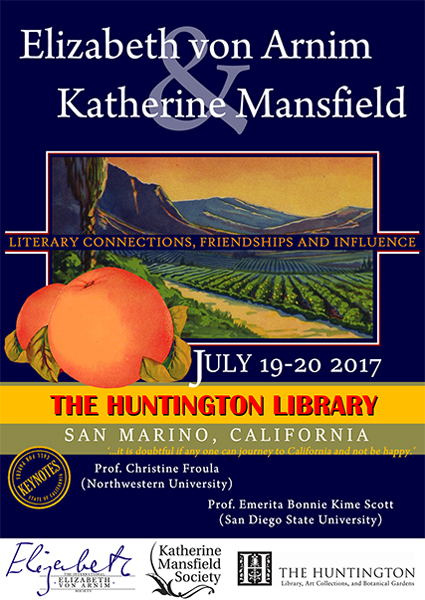 This conference seeks to explore the literary connections, friendships and influences that shaped Mansfield and von Arnim’s work. Building on recent scholarship, we are seeking papers that situate Mansfield and von Arnim within the literary field, their friendship networks and within their own extensive family. As well as holding the Elizabeth von Arnim (Countess Russell) papers, the Huntington is a destination venue in its own right. The library is located in glorious botanical gardens and the library houses a world class art collection. Conference paper proposals due tomorrow!